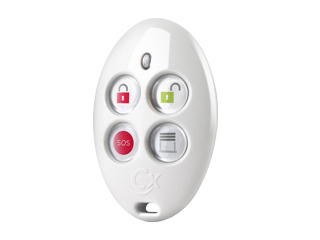 Two-way 868 MHz keyfob with Combivox design. 4 buttons, each programmable for a different function (arming/disarming, anti-panic function, activation of output(s) command(s), macro, etc.). Button programmable for control panel status questioning (armed/disarmed area, open zone, etc.). Triple colour led to confirm the command execution. Endowed with adhesive labels to customize the function keys.